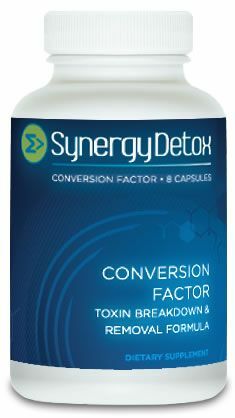 The Synergy Detox Conversion Factor detoxification system is designed to temporarily reduce toxin levels in your urine so they fall below detectable levels in a laboratory urine drug test. Designed for the light user (1 time per week or less) with any body weight. Use coupon code SYD at checkout and get 10% off this product. Free FedEx ground shipping. Express shipping options available. Reliable pre and after sale customer support if needed. Email us anytime or call 1-888-516-6120 during business hours. The Conversion Factor temporary detoxification system gives you up to a 5 hour window to pass a urine drug test. Temporary detoxification with Conversion Factor is achieved by consuming 8 capsules over a period on one hour. After this 1 hour consumption period, you'll have up to five hours to take a urine drug test and expect clean results. Included are two home urine test kits of your choice so you can test yourself after completion of the system to ensure you are clean. Conversion Factor is a potent but safe blend of botanical diuretics and essential nutrients that effectively detoxify your urine on a temporary basis. This product is ideal for people who are light user (1 time per week or less) with any body weight. Synergy Detox products are cleansing systems, and not masking formulas. You pass the urine test because our system clears your urinary tract of toxins, not because the toxins are masked or the test results altered with the help of foreign additives. Synergy Detox cleansing is done using natural botanicals and vitamins. Conversion Factor temporary formula has been tested thousands of times with passing results. It's undoubtedly the healthiest and most powerful way to temporarily flush out toxins from your system in order to pass a urine drug test.